One of the funniest scenes in Series 7 of Cold Feet captures the older generation’s bafflement with Millennial culture. Adam endures a painfully awkward job interview at a thriving start-up, conducted on beanbags in an indoor treehouse. Outside there’s a huge slide dropping into an adult ball pit and a cascading waterfall. The story is retold via flashbacks using primary school children as stand-ins for the real interviewers who “haven’t even started shaving yet”. It all seems too far-fetched to to be true. Surely an office like this doesn’t really exist? Well, yes, it does. The scene was filmed at the Social Chain office on Portland Street in Manchester, which has been shortlisted for Prolific North’s Inspired Spaces. 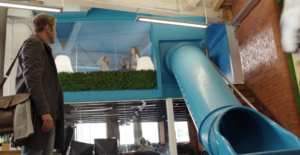 There is an “adult ball pool”, and there is a tree house meeting room. Social Chain is a social-first agency that was established in November 2014 and has an average age of just 21. Having started in Manchester, it now also has offices in Berlin and New York.